Studying the formation of stars has been a fascinating topic for astronomers and laymen for decades – providing important clues about the creation of our own solar system. Our Earth and the Solar System are over 4.6 billion years old and our knowledge about its formation is incomplete - so we look to the birth of other nearby stars and stellar systems to better understand our own beginnings. Carbon monoxide provides the primary tracer for interstellar clouds where stars form, but it has never been detected in galaxies which have a low level of oxygen compared to hydrogen – such as dwarf galaxies. Yet we know that these low-mass galaxies often form stars. But an international group of astronomers, including researchers from the University’s Centre for Astrophysics Research, has managed to break the record for the detection of the important carbon monoxide molecule, CO, in dwarf galaxies. These small, low-mass galaxies are some ten times smaller than their larger cousins, like our Milky Way galaxy or the galaxy in Andromeda. In these larger galaxies, stars form continuously - many ending their lives as supernovae ejecting processed material such as carbon and oxygen into their immediate environment, rather confusingly called “metals” by astronomers. In contrast, star formation in dwarf galaxies, and subsequent ejection of material, occurs at a much lower rate and, as a consequence, the abundance of carbon and oxygen is very low. This has prevented the detection of carbon monoxide in dwarf galaxies where this abundance is lower than twenty per cent of the Milky Way value. 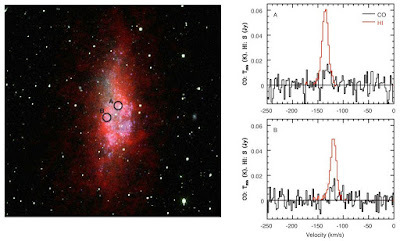 Observations with the APEX telescope in Chile, which is co-owned by the European ESO observatory, were successful in detecting carbon monoxide in the dwarf galaxy called Wolf–Lundmark–Melotte (WLM) which has an abundance as low as thirteen per cent, setting a new record. These results, published in Nature, form an important step towards understanding star formation under conditions that prevailed in the early Universe. 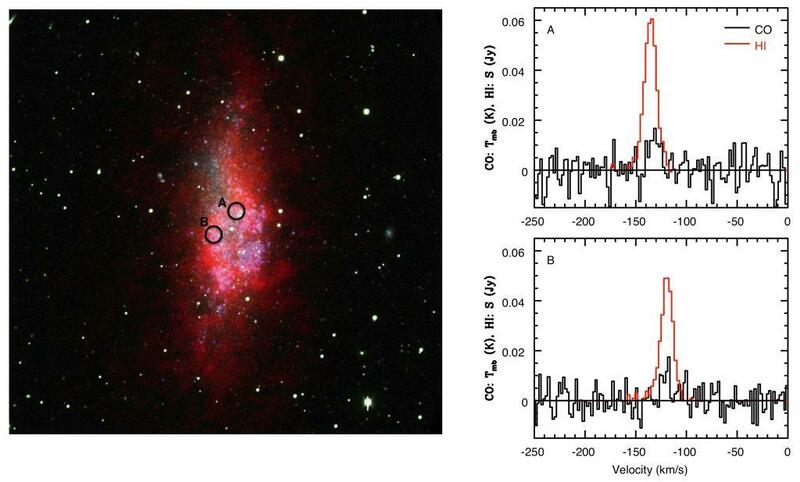 “Carbon monoxide in clouds at low metallicity in the dwarf irregular galaxy WLM” was published in Nature on 28 March 2013.